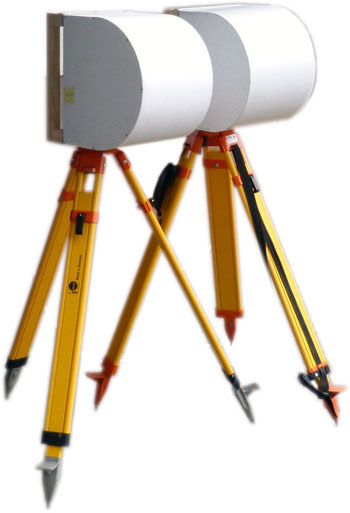 The VIY3 series Ground Penetrating Radars (GPR) are radars for underground sounding, designed for locating and analysis of subsurface items and anomalies with the aid of electromagnetic pulse radiation. Pipes, cables finding and mapping on the location plan. Material of items can vary - metal, plastic, concrete, asbestos, fiber-optic etc. Original Software. Free of charge for Users. All accessories (GPS, odometer) can be connected directly to antenna unit without any extra cables, without any additional connection with antenna and laptop. VIY3-070 GPR – has the lowest central frequency in VIY3 GPR product range. This GPR can be successfully applied in research and mapping of subterranean geological layers, big voids and other objects. The penetration depth is up to 30 m.
GPR consists of two antenna units - receiver and transmitter. Both of them are fully shielded, that allows to minimize external (surface) interferences. VIY3-125 GPR – the device applicable for deep deposited objects and the ones of big volume. Max.sounding depth (thickness) – down to 15 meters. Shielded antenna usage allows to minimize unwanted noises from external surface objects. VIY3-300 GPR is the optimal solution for underground objects (or construction structure) topography and mapping, where high depth goes with high scanning resolution. Max.sounding depth (thickness) – down to 8 meters. VIY3-500 GPR combines both portability and good sounding depth. May apply where high resolution of sounding is very important. Max.sounding depth (thickness) – down to 4 meters. Transient Technologies LLC designs and manufactures embedded circuit boards, different custom electronics with unique product requirements of customers. The VIY3-500 ground penetrating radar (GPR) is used for location and analysis of underground anomalies using electromagnetic pulse radiation. The GPR VIY3-500 is suitable for searching of both metal and dielectric targets (pipes, voids, building constructions etc. ).